I'm sad to say that due to her increasingly hectic schedule Dana will no longer be contributing to Making It! I wish her all the best and I urge everyone to keep in touch with Dana by continuing to read her blog over at www.leililaloo.blogspot.com. Where there is bad news... there's always good news!!! 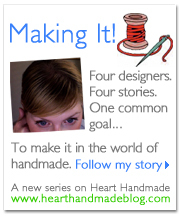 Susan of parkersewn has kindly stepped in to complete the Making It! roster. I've been a fan of Susan's adorable pillows and wall art for some time now and I was thrilled when she said yes! shop came to be but honestly I just love pillows & all things pretty. york. To then when I moved to Las Vegas doing visuals & merchandising. One day it just came to me, a cruel reality that it needed to stop. is wrong. So I literally one day walked into work & quit on the spot. wood floors & beautiful trees outside that turn with the seasons." Welcome Susan! Your pillows and wall art are so lovely and I am so happy to see you here! All the best to Dana as well.